Bryce Harlow was one of the most extraordinary political figures in the United States in the second half of the 20th century. He served four Presidents with honor and distinction. Dr. Henry Kissinger observes that Harlow spent his entire life studying the ways of Washington, D.C., alternating between participant and observer. 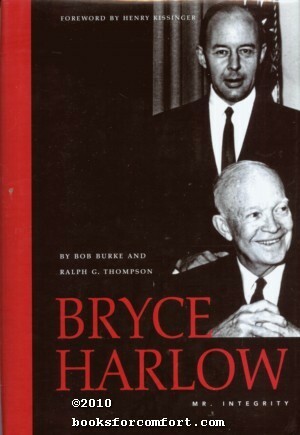 Bryce Harlow was one of the most extraordinary political figures in the United States in the second half of the 20th century. He served four presidents with great honor and distinction. His word was his bond. With his gentle manner and Oklahoma drawl, Harlow advised Presidents on more public issues than perhaps anyone in American history. Dr. Henry Kissinger says Harlow spent his entire adult life studying the ways of Washington, D.C., alternating between participant and observer. Harlow had a deep sense for the Presidency, its power, its majesty, and the awful responsibility it imposes. What made Harlow the greatest power broker of his ear was that he was worthy of the trust placed in him. No other figure in official Washington had such universal respect. One congressman called him the very soul of integrity. Harlow was known for his insight and his wit. Based on four decades in the nation's capital, six national campaigns, and six national political conventions, he described the American President as one we take on trial for four years with a renewable option for another four, and to whom we give on-the-job training at great national risk. This is the story of Harlow's influence on the descisions that shaped the history of the Republic.